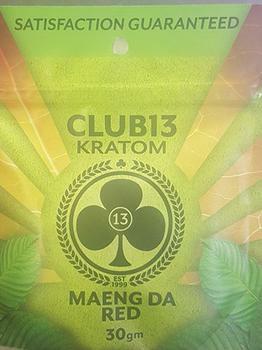 Club 13 of St. Augustine, Fla., is recalling "Maeng Da Red" and “Maeng Da Red XS” kratom. The “Maeng Da Red” powder products come in 15-gram, 30-gram, 90-gram, 150-gram, and 454-gram packages marked with lot # MRMD012618 on the back of the pouch. The “Maeng Da Red” capsule products come in 5-count, 25-count, 50-count, 100-count, 120-count capsule bottles marked with the following lot numbers on the bottom left side: MRMD013018, MRMD013118, MRMD020118, MRMD020518, MRMD022318, MRMD022718, MRMD030118, MRMD030218, and MRMD030618. The “Maeng Da Red XS” capsule products come in 5-count, 20-count, 25-count, 40-count, 50-count capsule bottles marked with the following lots numbers on the bottom left side: KRXS020718, KRXS030618, KRXS102417, KRXS110617, and KRXS120117. The recalled products were sold nationwide in retail stores and through mail orders. Consumers with questions may contact the company at 877-922-5783, Monday through Friday from 9:15 AM to 5:30 PM (EST).